Security Product Depot collects two different types of information through our website: anonymous information and personally identifiable information. First, we collect and store anonymous, aggregate information (such as internet protocol (IP) addresses, browser types, search engines, internet service provider (ISP), referring/exit pages, platform type, date/time stamp, and number of clicks) from all visitors to our website. The anonymous information that we do collect from your visit is never linked to your personally identifiable information until you voluntarily submit that personal information, in which case some otherwise anonymous information may be connected to your website activity and personal account. Otherwise, the anonymous information is only used in the aggregate to analyze trends, administer the website, diagnose any problems, track a visitor's movement in the aggregate, and gather broad demographic information for aggregate use. We may provide this anonymous information in aggregate form to other parties or use it for our own insight or marketing purposes. Our ability to use this information is not restricted in any way. To help us manage our advertising and website, Google offers many products in addition to Google Analytics, including Google’s Analytics for Display Advertisers, AdSense. Security Product Depot may participate in Google display ad products or services, known as Google Analytics for Display Advertisers. As with Google Analytics, you can learn more about Google Analytics for Display Advertisers, or you can opt out, by going to https://tools.google.com/dlpage/gaoptout. Security Product Depot does not sell, rent, or share personally identifiable information to or with any third party. We may also need to contact you for purposes other than marketing, for example to provide notice about the status of our website or the specific services you have requested. We also use this information to the extent necessary to enforce our website terms of service and to prevent imminent harm to persons or property. You may not opt-out of these kinds of communications. Consistent with our change policy (see "Your Consent and Notification of Changes" below), we will post any updates or notices about material changes in our policies on collection and use of your personally identifiable information to this Privacy Statement page. 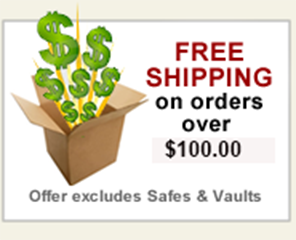 Security Product Depot may use manufacturers or suppliers to ship products you have purchased including your name and address, however, we do not provide any financial information. Security Product Depot is not responsible for the privacy practices or content of these other sites. We encourage you to be aware when you leave our website and to read the Privacy Statement of each and every site that collects personally identifiable information from you. Our Privacy Statement applies solely to information collected by our website. Security Security Product Depot takes commercially reasonable precautions to protect your personally identifiable information. For example, we encrypt communications through our website, however, given the nature of the Internet and the fact that network security measures are not perfect, we cannot guarantee the absolute security of your information. If we are required to provide notice to you of a data security breach, the notice will be provided in electronic form. By using our website or submitting information to us online, you agree that we may collect and use this information as stated in this Privacy Statement at the time we collect the information. If we decide to change our Privacy Statement in any material way, the current policy will be in effect as of the Effective Date below. In addition, if we make any material changes in our privacy practices that affect your personally identifiable information already stored in our database, we apply those changes to the personally identifiable information in our possession only as permitted by applicable law. This Privacy Statement applies to all visitors and customers of our website. We may delete any or all of your information at any time without notice to you for any reason or no reason unless otherwise required by law to retain it. You may have other privacy protections under state laws and we will comply with any applicable state laws when we disclose information about you. This Privacy Statement replaces any previous policy on this topic and any statements or disclosures to you about our information practices.